“To score on and off the field, your child must first have clear goals and the will, knowledge, and discipline to attain them,” says Bruce Beaton. 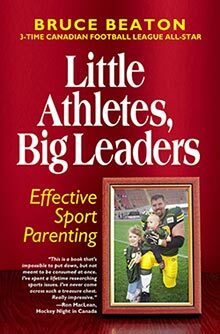 He’s a Canadian Football League All-Star, two-time Grey Cup winner and author of Little Athletes Big Leaders: Effective Sports Parenting. I love this book, being the grandma of five boys, all involved in one sport or another. I spend a lot of time cheering on the sidelines of baseball diamonds, soccer fields, basketball courts. Trust me, Beaton, with his in-depth and honest approach, has written the go-to guide for parents who want to raise kids to be leaders in youth sports and beyond. Benton says, “Children generally model what they see, and react less effectively to what they hear, especially when the two contradict. Why not set a goal to teach children by example, and then use your voice to question, guide, and connect?” As a role model for your kids, this may be reinforcing what you already know or a wake-up call. Beaton warns parents not to be negative with their sports parenting. “Our positive talk will become their positive self-talk, and we will create an enthusiastic athlete who loves the entire learning experience.” He encourages parents to notice and comment often on their kids’ hard work, team spirit, persistence, winning attitude. If you’re a parent, remember that little eyes are watching and little ears are listening. Your children see potential through your eyes, create connections through your hands and discover opportunity through your choices. You are the filter through which your kids learn how to get along with others and how to make a difference in the world. Help them build their character and skills while they build their goals and dreams. On Bruce’s website, you can read more about him, his ideas and his book.